When I’m traveling, I love experiencing the flavors of my destination. But, I have to admit, restaurants aren’t always the best at providing the kind of local cuisine I want to try. Which is where my search for great street food begins. Countries like India and Vietnam have tons of excellent street food, but the food trucks in the United States are my favorite. From New York to California, food trucks are going upscale taking simple street food like tacos, noodles, and pork roast and elevating them to meals worth paying restaurant prices for. Food trucks are also one of my techniques to discover a city’s unknown quarters. These mobile restaurants, which are sometimes helmed by classically trained chefs, wander the streets of San Francisco, Chicago, and New York, setting up short-term shop at different neighborhoods during the week. Hunting for the best food truck location and discovering the variety of cuisine they can offer has become an adventure for many food lovers. One of the incomparable delights of visiting San Francisco for me is a small food truck called Roli Roti. 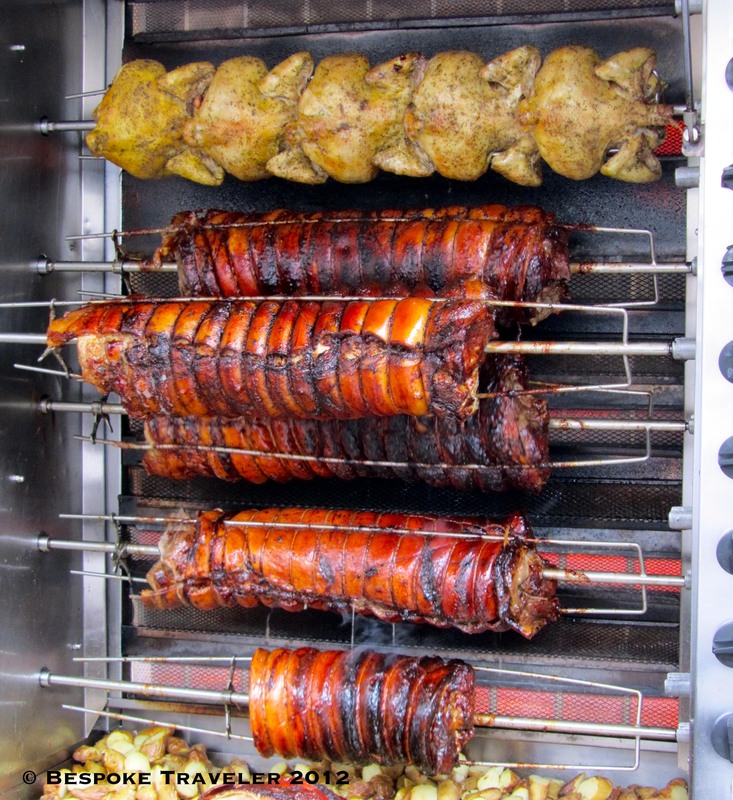 This delicious kitchen on wheels serves up mouth-watering rotisserie chicken and pork that is locally farmed. How do I find them? By looking at their weekly schedule and the long line of famished followers standing on the street! Fans swear by their delicious porchetta sandwich, a decadent concoction of pork loin wrapped inside pork belly slowly roasted, then sliced onto whole bread. The recipe is like any other porchetta sandwich, but what drives the foodies to Roli Roti is their signature sauce of onion-garlic marmalade which they generously spread on the sandwich along with crisp, fresh arugula. Even if you’re not a pork or chicken fan, you can still enjoy the flavor of their roasted rosemary potatoes or simply be entertained by the food truck experience. Of course San Francisco isn’t the only place to enjoy food trucks and street food. Plenty of other destinations have both elevated street food and simple but tasty food trucks to discover. Have fond memories of a particular food truck or street food stall? Let me know! You should absolutely visit California for the food! There is so much variety and so many places dedicated to the locavore experience. It’s definitely worth it. I hope that the food truck craze will continue to grow because who doesn’t like street food?! Cheers. yes, roli toti is delicious! we live in salt lake city and the food trucks are pretty sparse here. We have one (The Chow Truck) that is pretty good. They have some great fried calamari tacos and sliders. Sounds like some great eats as well. When I visit Salt Lake City, I’ll look for it. Cheers. I remember particularly going to NY and having the famous halal chicken and lamb from 53rd and 6th halal cart. Delicious food, addictive white sauce, and awesome sense of achievement for beating the mile long lineup. Street food of New York is amazing in its diversity, and it’s such a treat when an out of the way food truck is discovered. Thanks for your comment! I so agree about not asking what’s in the food. Street food needs a courageous mind and stomach! Thanks for sharing. Cheers, the Cabbie.